Our Friday nights almost always involve dinner with friends. By “dinner” we mean a half dozen margaritas interspersed with some food, and by “friends” we mean more margaritas. If and when we are forced to take slight, brain-freeze induced hiatuses from pounding frozen drinks, we like to warm our hands up with brisket tacos. 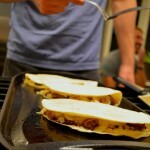 Since we recently banged out a killer taco recipe, we decided to make quesadillas. 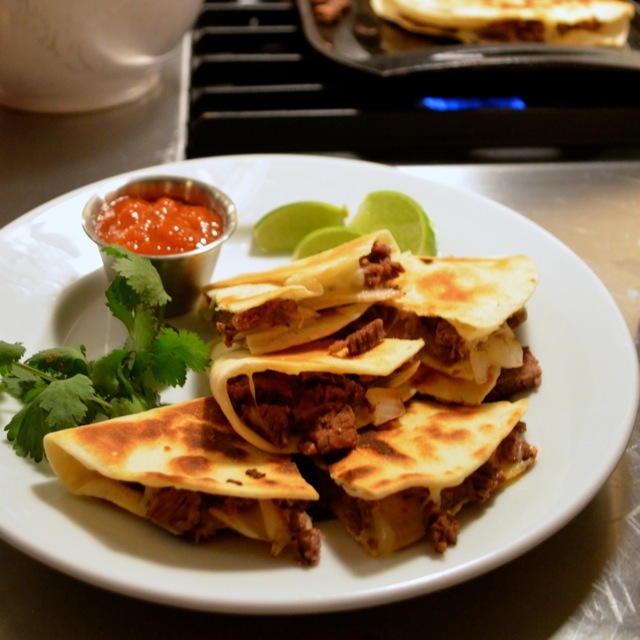 Now, these quesadillas are delicious as they are, but if you think for a second you can skip the sauce, you can shut your stupid mouth. This sauce is amazing. 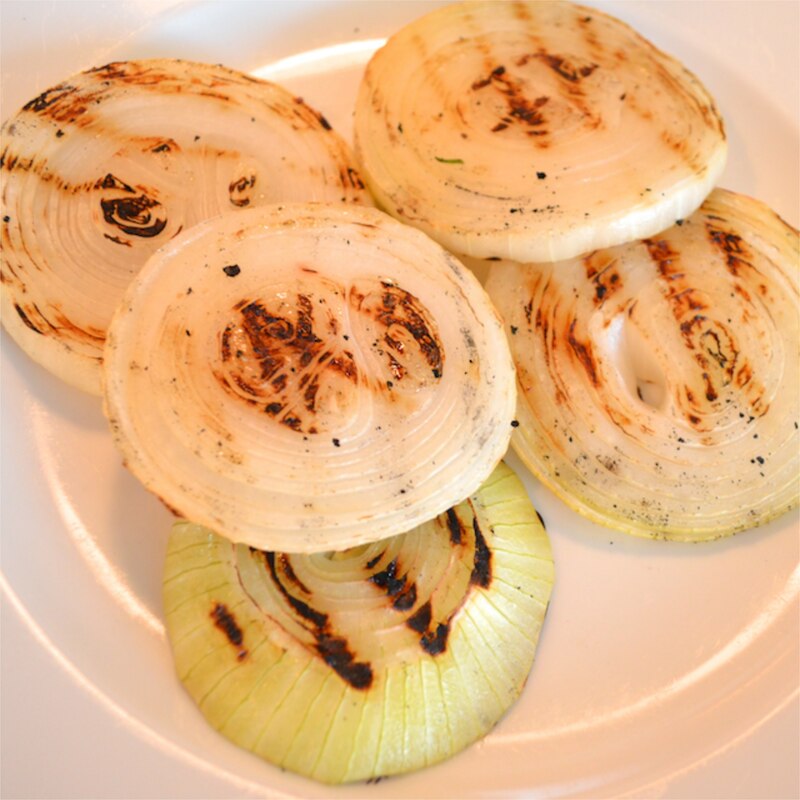 Preheat griddle to high heat and grill onion rings until slightly charred and tender. Let cool and chop into 1/2 pieces. 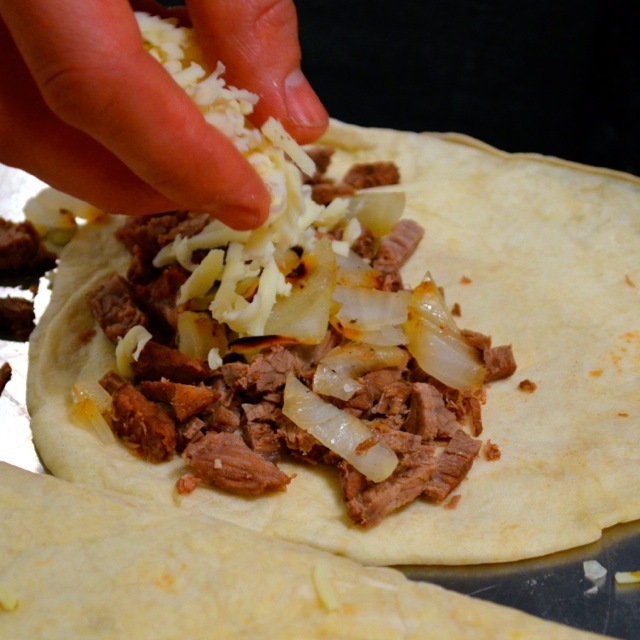 While griddle is still hot, arrange 1/2 cup of brisket along half of tortilla, top with desired amount of onion, and sprinkle with some of both cheeses. 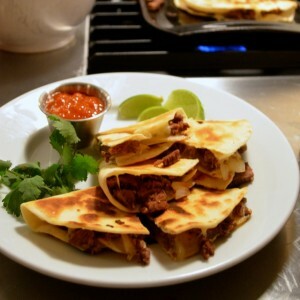 Fold over tortilla and brush lightly on each side with small amount of vegetable oil, cook on both sides until tortilla is golden brown, about 3-4 minutes per side. 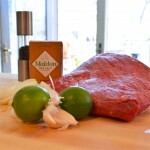 Garnish with lime wedges and cilantro and serve hot, alongside queer in the kitchen honey-bourbon barbecue sauce. 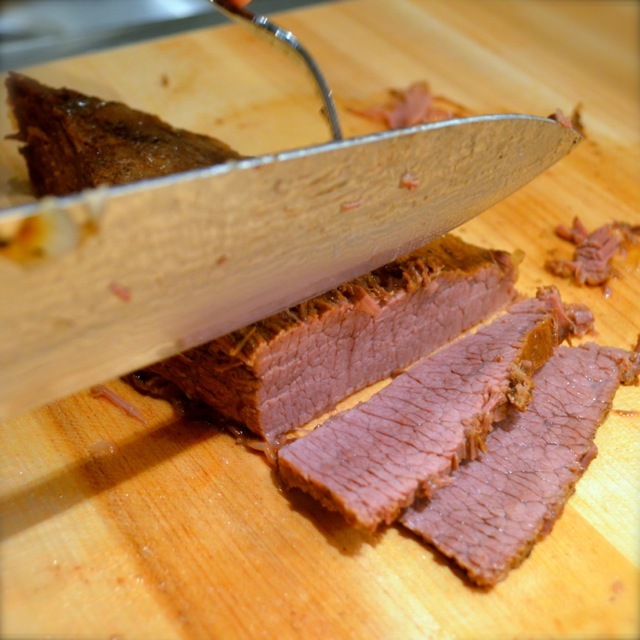 Let brisket come to room temperature on counter, about 45 minutes to 1 hour. Season both sides with salt and pepper. 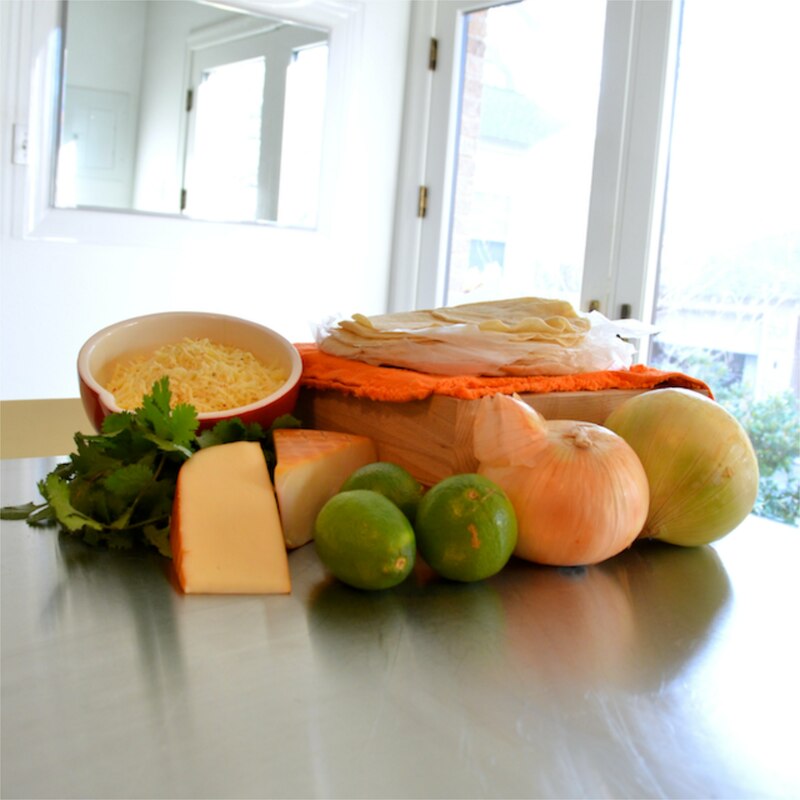 Combine all other ingredients except onions in a dutch oven and whisk together to combine. 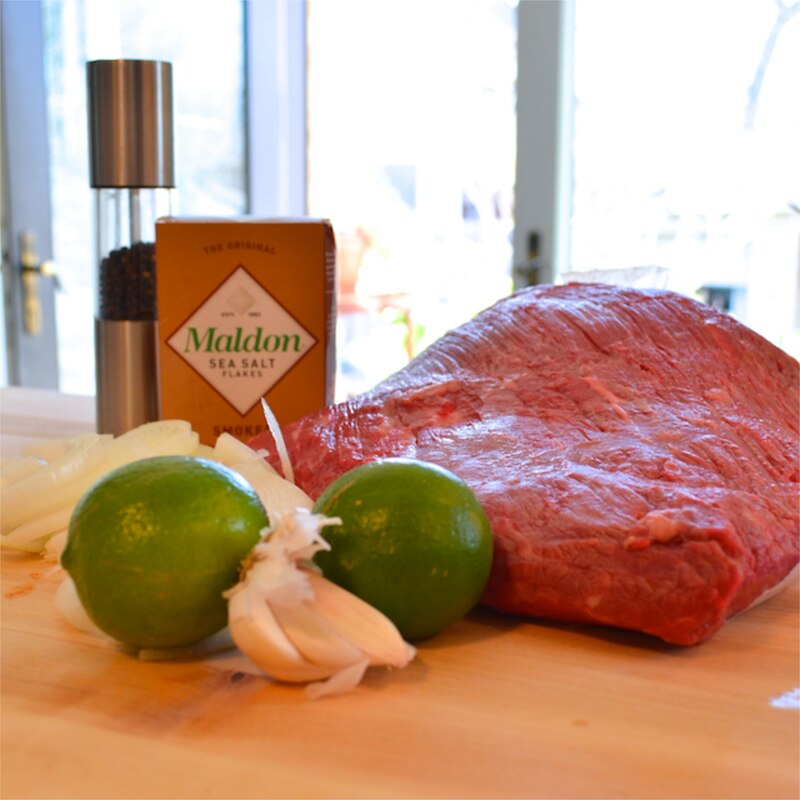 Place brisket fat side up in liquid, cover with onions, cover and place in oven for 3-4 hours, or until tender when pierced with a fork, turning once halfway through. 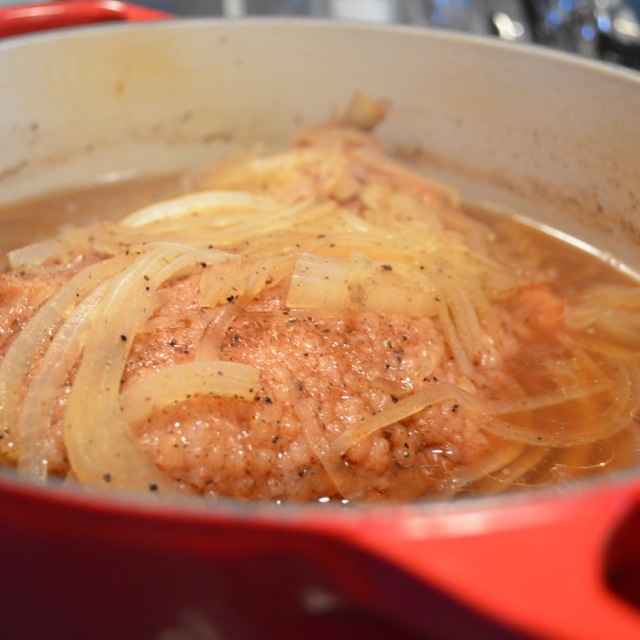 Drain liquid and onions from brisket and discard. 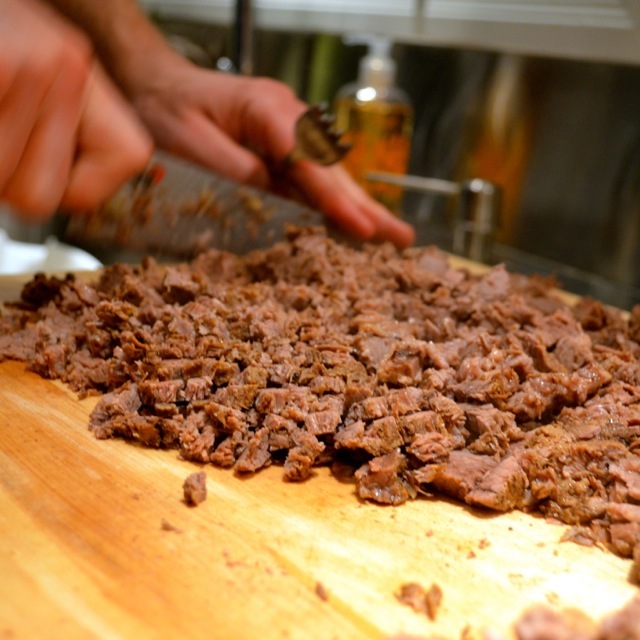 Trim fat from meat and slice across grain into 1/2 inch sections, then proceed to chop as desired. In a medium saucepan over high heat, sauté onions and garlic until fragrant and beginning to soften, about 5-8 minutes. 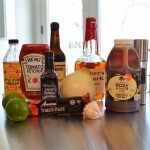 Add bourbon and simmer for 10 additional minutes. Meanwhile, combine all remaining ingredients in a bowl and whisk well to combine. When onions are finished simmering, add liquid, reduce heat to medium low and simmer for 20 minutes uncovered, stirring every five minutes or so. Remove from heat and let cool slightly, then transfer to blender and puree until smooth. 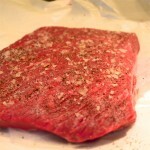 Can be kept sealed in refrigerator for up to two weeks.